Knowing how to use simple home remedies for healing and disinfecting cuts and scrapes an important part in taking care of your family and yourself. Once you determine an injury doesn't merit a trip to the emergency room for stitches, you can break out your home herbalist kit. Honey is a time-honored wound healer because of its natural antibacterial properties, and kids and pets love it. Use a good quality raw honey cover with gauze and tape in place. You can also be prepared with herbal oils, salves and balms that are soothing, anti-inflammatory, and antibacterial - these homemade preparations can heal wounds of all kinds very effectively. Knowing which plants and leaves make the best field dressing can save the day as well as save money. Most of these handy plants grow freely in any yard not drenched with herbicides. Speedwell makes a simple and effective lotion or skin wash that speeds wound healing and relieves itching. The fresh leaves of plantain, a common plant found growing in many backyards has potent antibacterial beneftis and quite is soothing when applied to a burn or a cut. Like comfrey, plantain contains allantoin, an anti-inflammatory phytochemical that speeds wound healing, stimulates the grow of new skin cells. Both of these plants seem to give the immune system a boost to fight infection. (Duke,James, Ph.D.) Chickweed poultices are useful for cooling and soothing minor burns and skin irritations, and rashes particularly when associated with dryness and itching. This tender young plant often volunteers in planters in early spring and has the added benefit of being a salad green as well as a first aid plant. These colors of these old fashioned garden flowers bring joy to the eye as well as being very important and useful members of your herbal first aid kit. The classic red Rose is astringent that helps staunch bleeding. Yarrow is a good first aid herb for nosebleeds, wounds and cuts. Both are best when used from fresh cut flowers and leaves. Strong Agrimony tea is often used as a herbal skin wash and can effectively stop bleeding from cuts and scrapes. Agrimony is also considered a very useful agent in skin eruptions and pimples,rashes, blotches, etc. (Grieve, Maud) Anti-inflammatory, astringent, and antiseptic, calendula is the queen of garden flowers that are used in skin care and first aid. Calendula creams, lotions, and infused oils promote new skin growth and slow down bleeding. 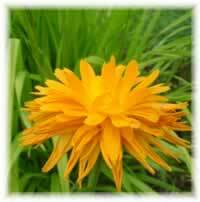 Use calendula tea made from the fresh flowers as a skin wash to heal even the most sensitive of skin. Comfrey salves and ointments are one of the best known herbal remedies for just about any skin irritation: burns, skin ulcerations, abrasions, lacerations, flea and insect bites. Comfrey works to heal skin so quickly that it is a good idea to add berberine containing herbs to to kill bacteria that could cause infection that could be trapped in a rapidly closing wound. Coptis, barberry, or Oregon grape are all good subsitutes for the endangered species of Goldenseal. All of these herbs have wide spectrum antibiotic and anti-inflammatory properties and make a good topical antiseptics for minor injuries. Aloe gel and witch hazel are the two most basic items to always keep on hand as they can be used alone or as carriers for essential oils and herbal tinctures. Aloe vera gel is soothing, anti-inflammatory, and antibacterial and can be used liberally on cuts, scrapes and wounds of all kinds. You can find aloe gel on the shelves of most pharmacies and stores, but be aware than most is diluted which alcohol gel and other ingrediants. Aloe is especially hydrating for dry, irritated skin. Witch hazel is one of the best general and all purpose remedy for scrapes, cuts and abrasions, scalds, sunburns and other inflammatory conditions of the skin. James Duke. "The Green Pharmacy Herbal Handbook" Rodale Books, (2000) Gotu kola speeds healing of wounds of all kinds and deters scarring and keloid formation. Maud Grieve. "Modern Herbal Volume 2" Harcourt, (1931) A lotion made from calendula flowers is most useful for sprains and wounds, and a water distilled from them is good for inflamed and sore eyes.
. Balm of Gilead , Moutain Rose Herbs, (): Antibacterial and anti-inflammatory, creams containing Balm of Gilead buds are used to treat frostbite, sunburn, superficial injuries of the skin, and external hemorrhoids. Charles F. Millspaugh. "American Medicinal Plants" Dover Publications, (0000) The famous Portland powder,(a combination of tonic and bitter herbs named for the Duke of Portland who made the remedy public) once noted for its efficacy in gout, has wormwood as its principal ingredient. 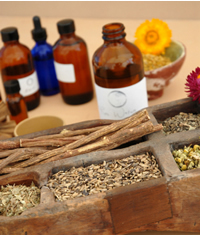 A decoction has ever been found a most excellent application for wounds, bruises, and sprains, relieving the pain nicely in most cases; every reader will recall 'wormwood and vinegar' in this connection.